Real ingredient goodness that's ready when you are! 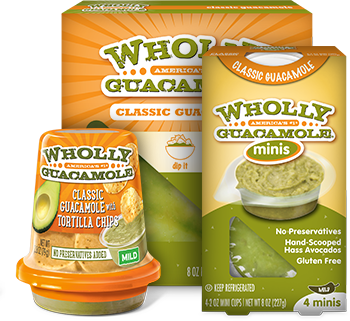 WHOLLY GUACAMOLE® products are made with real ingredients – the kind you can pronounce. 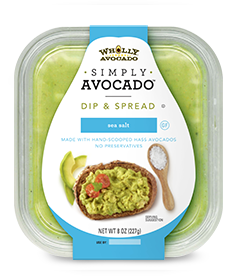 Packed with 100% hand-scooped Hass avocados and no added preservatives, there’s no need to deal with tricky avocados that may not be ready when you want them to be. 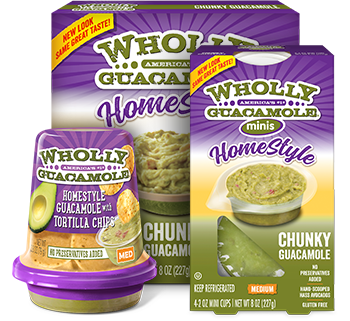 Enjoy hassle free guacamole, perfectly seasoned and ready to snack, dip and spread when you are. It’s the flavor that started it all! 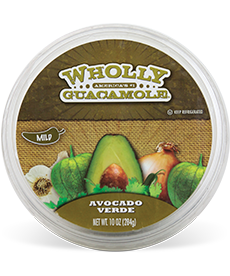 Made from real Hass avocados, hand-scooped at the height of freshness and ready to enjoy exactly when you want it. Hassle free, just the way you like it. Dip it. Top it. Spread it! Hot, bold and delicious. 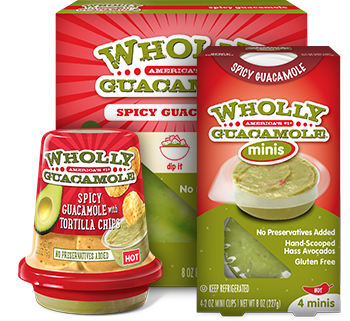 Made with real jalapeño chili peppers, this guac is definitely not for the meek. Created with chunks of avocado, tomato, onion, cilantro and a touch of lime, this one is as perfect for your chip as it is topped on a burger. Skip the chopping and the worry of “is it ready or not” with your avocado and go straight to the dipping and enjoying. Our Classic flavor, certified organic and incredibly delicious. 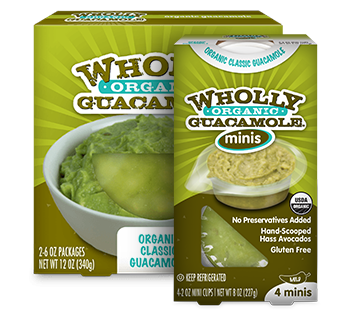 Is it hard to make a guac organic, vegan, kosher and preservative-free? For us, it’s easy. Made with fiery hot Hatch chiles, this is the ideal guac for adding heat to your meal. 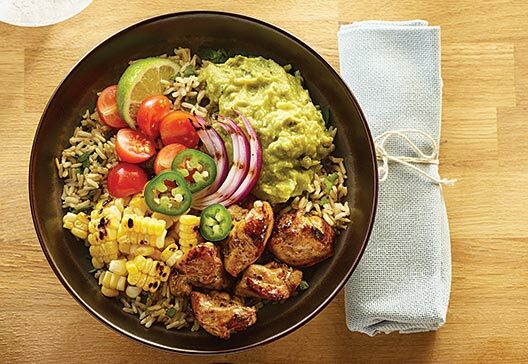 This Southwestern flavor has a kick, but isn’t too hot. 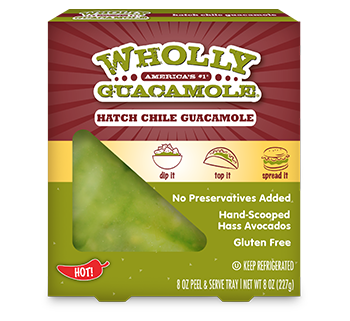 Made with a perfectly balanced blend of jalapeño, poblano and Hatch chile peppers. 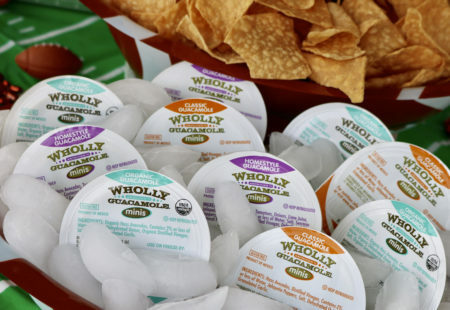 Check out more of the WHOLLY® family of products, made from a lot of good stuff. The spread packs in big flavor with four ingredients or less. Delicious dips ready to share. Or keep for yourself. Just dig in and snack on. Turn things up a notch! 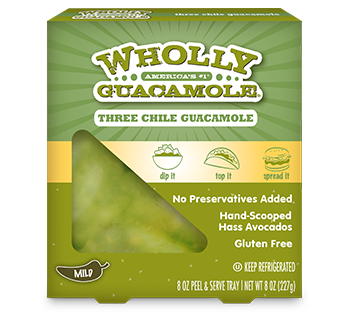 Enjoy savory comfort food loaded with Mexican spices and topped with our Three Chile flavor of guacamole. Here’s a tip: make a double batch and have leftovers for lunch the next day.